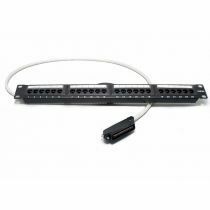 VG310 Voice Gateway - 24way leaded panels 19” Rack Mounting. Front Fully populated with 24 RJ45 modules. RJ45 Pins active on 4 & 5. RJ21 Telco tail 90, 180 or 120 degree hood. Individual slide marking system RJ21 Telco terminated directly on to the RJ45 Panel, 2mt lead as standard. Active on the voice pair of each socket (pins 4&5). Simply plug the RJ21 connector into your voice gateway to provide connectivity. Terminated RJ21 telco can be manufactured to any cablelength required. VG310 24w RJ45 Leaded Panel - 1mt Male Tail 90 Degree Hood. VG310 24w RJ45 Leaded Panel - 2mt Male Tail 90 Degree Hood. VG310 24w RJ45 Leaded Panel - 3mt Male Tail 90 Degree Hood. VG310 24w RJ45 Leaded Panel - 5mt Male Tail 90 Degree Hood. 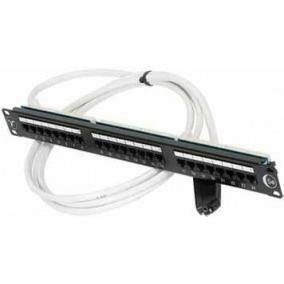 VG310 24w RJ45 Leaded Panel - 10mt Male tail 90 Degree Hood. VG310 24w RJ45 Leaded Panel - 15mt Male Tail 90 Degree Hood. VG310 24w RJ45 Leaded Panel - 20mt Male tail 90 Degree Hood.